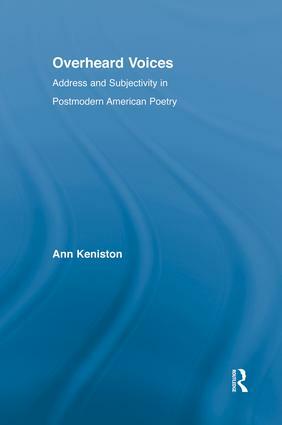 Overheard Voices examines poetic address and in particular apostrophe (the address of absent or inanimate others) in the work of four post-World War II American poets, with a focus on loss, desire, figuration, audience, and subjectivity. By approaching these crucial issues from an unexpected angle--through a study of the seldom-examined lyric "you"--Overheard Voices offers new insight into both contemporary lyric and the lyric genre more generally. The book offers detailed readings of Sylvia Plath, James Merrill, Louise Glück, and Frank Bidart.